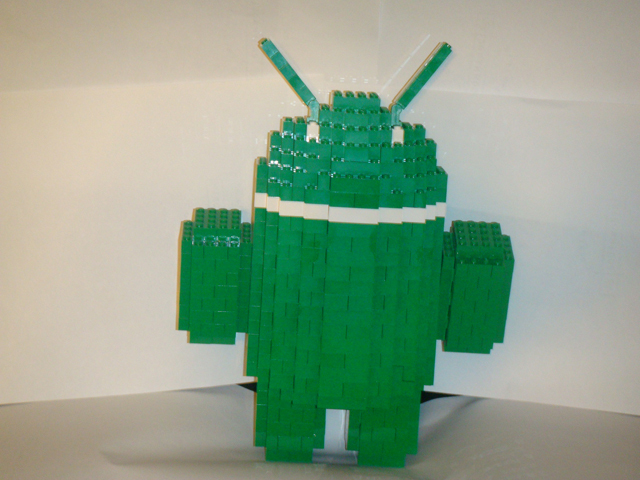 Of late, most of my posts have been about Lego, the Droid phone and the Android operating system, so I thought I’d combine and them and create the Android logo / mascot out of Lego, in full 3D. The size of the Android was dictated by the dome on the top half of the Android. I had originally planned to work on a smaller scale, but when built, the head didn’t work right. Instead of bottom up, I redid the design from the top down, by doing the dome first and making sure it was the proper shape for the design and able to work the level of detail I desired. The arms and legs were made a little thicker than the design in the real logo in order for the legs to support the Android. The arms are attached with pegs, so they can pivot. I included a picture to the left of the original attempt. 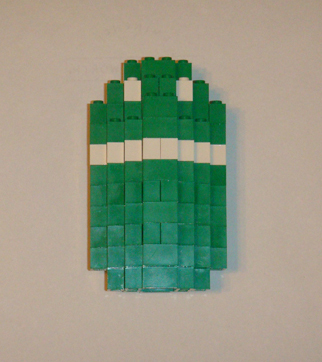 While it is feasible to create the Android at this side, it would require green plates, and since I only had green bricks to work with, I needed to scale up. If you like my designs, feel free to check out my Etsy store or let me know if there’s anything you’d like me to build.